Wait, what’s the heat exchanger? That’s a good question—and the best place to start. 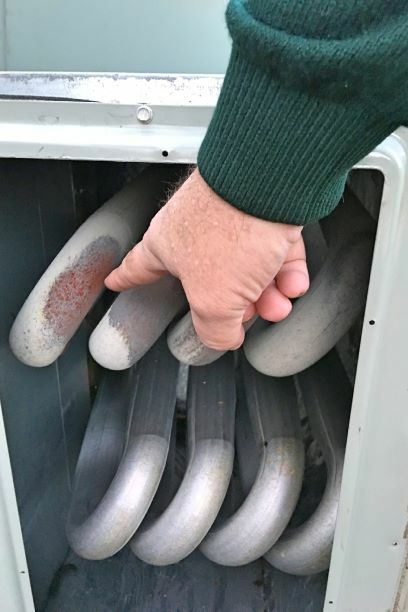 The heat exchanger is an essential part of your furnace. It’s designed to contain the hot combustion gases from the burner and transfer their heat to the air passing through the furnace and into the ductwork. The metal chambers of the heat exchanger prevent the combustion gases from mingling with the air that enters your house and which you breathe. And you definitely don’t want to breathe what’s in the heat exchanger! One of the byproducts is carbon monoxide, which is especially deadly. If the heat exchanger cracks, it can stretch open to allow for these toxic pollutants to escape—and go right into your home’s air. 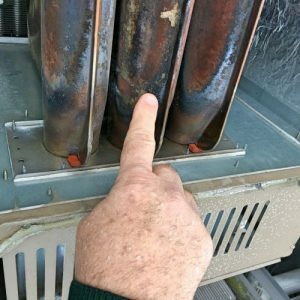 Why does a heat exchanger crack? The result of stress on the furnace creates metal fatigue, which shows up as small holes and cracks, often along with rust. Even pinhole leaks can allow a dangerous amount of carbon monoxide to leak out. It may not look “all that bad,” but it can be. The only way to accurately assess the problem is with combustion analysis, which our experts perform on all systems. This problem must be fixed—and we’ll fix it! If our team finds a cracked heat exchanger, they cannot legally allow the heating system to continue running because of the danger … and the liability! The unit must be condemned and either the heat exchanger or the whole furnace must be replaced. There are no shortcuts! We understand this can be unpleasant news. But discovering a cracked heat exchanger and fixing it prevents the potentially lethal danger from leaking gas! You’ll need to have fast, professional furnace repair in Alcoa, TN to repair the problem, and you can trust our technicians to do the best job that will keep your family safe. We’re not just here to heat your home, we’re here to protect it and the people in it. Russell & Abbott serves Blount, Knox, and Loudon Counties and the surrounding areas. We have the furnace service you need!